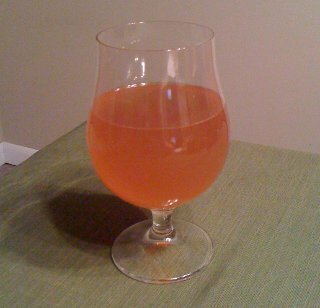 After three weeks in the fermenter, I've finally managed to bottle my Belgian Style Tripel. Since this was a high-gravity beer, it required additional time in the fermenter and will most likely take a while to condition in the bottles as well. I'm hoping to check it out in about 3 weeks, just to see how it's doing. The Final Gravity ended up being somewhere around 1.015 (maybe a little less). The more I use a hydrometer, the less confident I am in the measurements. I got somewhat inconsistent readings. Nevertheless, it was definitely lower than the recipe's goal of 1.020. My last beer also ended up lower than the recommended FG, so perhaps I should bottle a little earlier in the process. If my math is correct, this yields a beer that is somewhere in the 9-10% ABV range, which is right in the middle of the proper range for Belgian style tripels. The recipe I was using was meant to imitate Westmalle Tripel, which is 9.5%, so I'm definitely in the right neighborhood. If I make some extreme assumptions about my hydrometer readings for both the OG and FG, the highest it could come out is around 10.5% ABV, which would be a little high for the style, but still within the general range of acceptable ABV. The process went smoothly, just like last time. No problems racking the beer from the fermenter to the bottling bucket. Sanitizing the bottles is tedious and repetitive, but easy enough. I was hoping to be able to use some 750 ml bottles I'd harvested from recent drinking, but it turns out that the caps I have don't fit on those bottles, which are slightly larger than the standard bottlecap. I had plenty of regular bottles, and even some 22 oz bombers that worked, so no real problem there, I just had to sanitize more bottles than I realized. Filling the bottles was kinda fun though, even if it's also tedious and repetitive. Something about using the bottling wand is just great fun. So that just about finishes up this batch. I'm already looking into a new batch of beer, though I'm torn about what style to go for next. If I brew again in the next few weeks, I could probably have something that's ready to drink right in time for summer. So I was thinking of trying my hand at a wheat beer (perhaps a Hefeweizen) or a Saison. Both tend to be lighter and more refreshing beers, so they're perfect for summer. Right now, I'm leaning towards the wheat beer because Saison is another Belgian style and I just finished something along those lines. Of course, I could end up brewing both (one for early summer, one for later summer), which would leave time for a fall batch (perhaps an IPA of some kind) and a winter batch (I was think a Belgian dubbel, perhaps with some added holiday spices).